January is not typically a month we think about for getting out and working in the garden. But in Florida where there is plenty of sunshine and lots of mild weather-days even the butterflies know how to make the most of winter. For so many of us much of our garden is brown and (seemingly) lifeless from the early December freezes our gardens sustained. We still have a couple of months left of wondering if we'll be visited by Old Man Winter again. Seeing with new-eyes and admiring with deeper appreciation beautiful bark and deciduous forms of trees helps me wait for spring. So the first thing to enlist is patience. It is NOT advised to start cutting back all the brown too early. The frost-bitten parts of your shrubs and perennials will actually further protect them should there be more frost and freezing nights in the forecast. 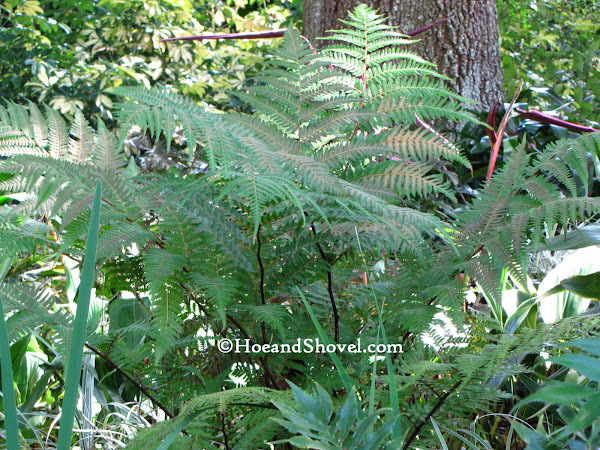 Try instead to engage a new perspective Florida gardeners haven't had to think too much about in the past. What if we learn to appreciate the winter interest all the wilted limbs offer among the existing green. I can tell the birds and wildlife are making use of the haggard limbs to perch and pick around for food. A good reminder that all is never lost. Right now I'm especially thankful for everything GREEN. Such a soothing hue as it mixes in with this newly-adopted 'winter interest' philosophy. I'll write more about the survivors in my garden later but starting this new year with renewed appreciation for stalwart natives and perennials is keeping me peaceful while I enlist much-needed patience for the next 8 or so weeks. Solidify plans and dreams for spring gardening. 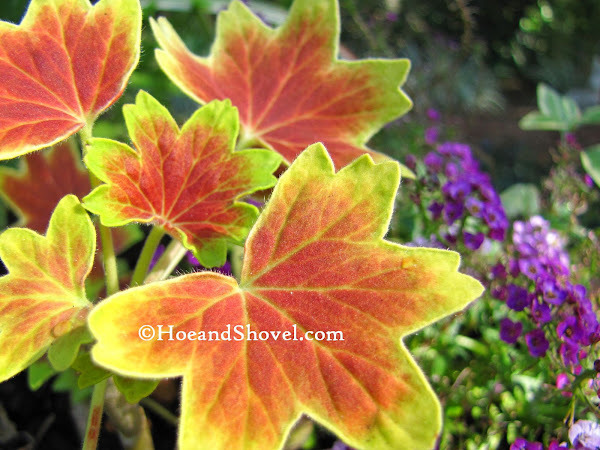 Wintertime is perfect for digging up lawn to enlarge borders or make new ones. Maybe you've always wanted to start a vegetable garden. Now is a good time to begin. With our mostly fabulous weather you'll use lots less sweat equity and energy to get the big jobs of preparation accomplished and you'll be ready to plant when it gets warm enough. Keep the weeds under control. You'll feel so accomplished when you take a few minutes each time you're out in the garden to pull some pesky weeds. For some reason weeds just keep right on invading this time of year. When spring rolls around you'll be so happy you didn't let them get the best of you. 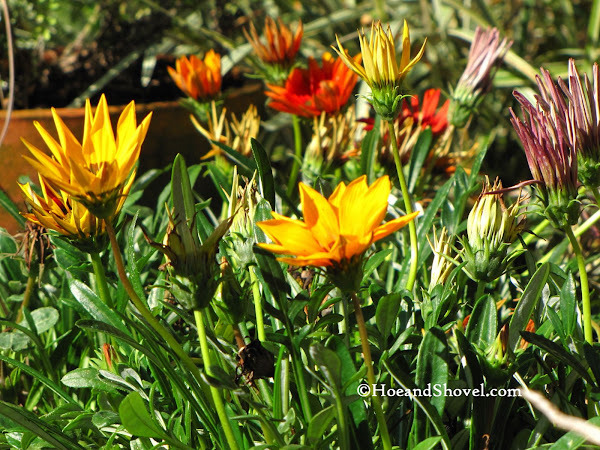 Don't be afraid to plant some cool-season annuals. 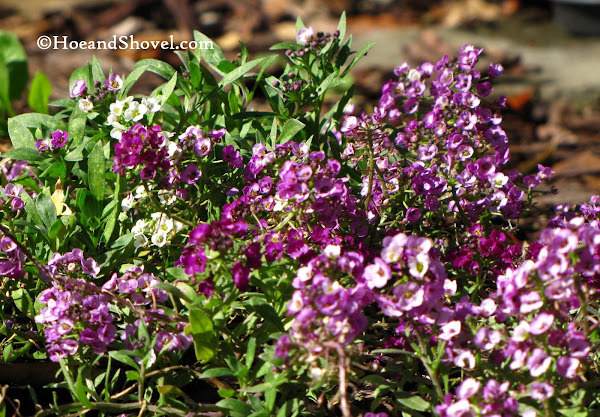 Winter annuals that thrive and do well right through March or April include pansies, violas, alyssum, petunias, snapdragons, gazanias, dianthus, and many more. 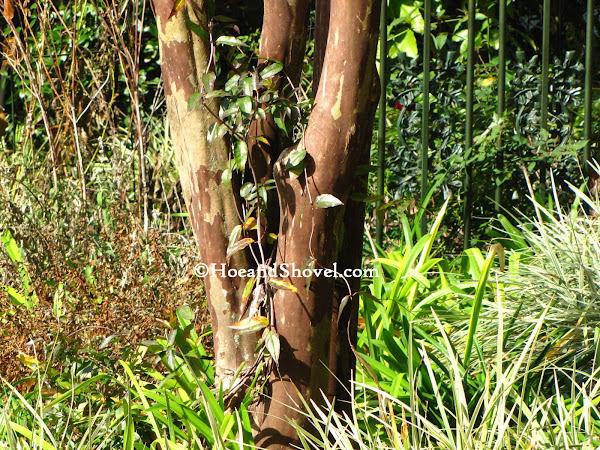 It will cheer up your container plants (where the soil warms up nicely on a sunny day) as well as your spirits to stop by your favorite garden center and invest a few dollars to brighten the landscape. While you're there, look around for good sales. 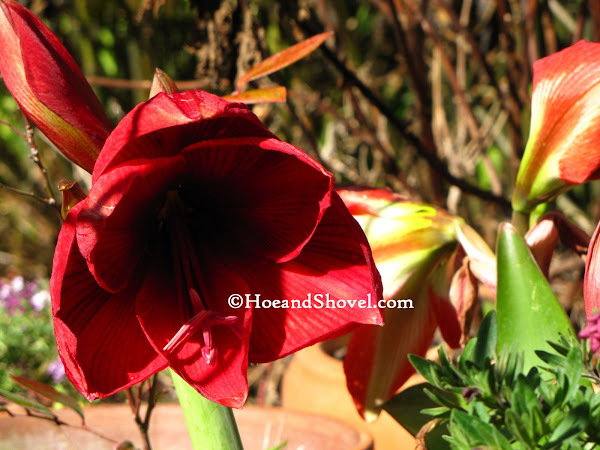 I found a few Amaryllis for dirt-cheap before Christmas. They are a cheery patch of color amid the lifeless clumps of brown. Take a look around your beds for signs of aging or decomposed mulch and be sure to protect the roots of plants with an added layer of mulch. Weeds can pop up easier where mulch recedes and a plentiful layer of organics really is good insurance to keep moisture where it belongs in our sandy soils. On one of our bright, sunny days with the refreshing cool air filling your lungs and that irresistible urge to be outdoors and get something done in the garden strikes... use it wisely. 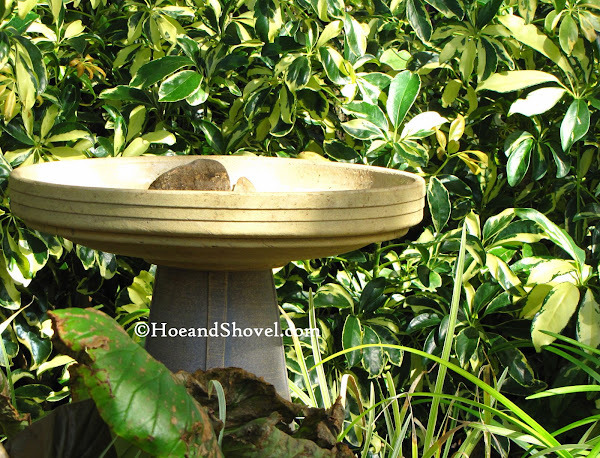 Bird feeders and birdbaths all need to be cleaned regularly for our wildlife friends. Scrub them with mild dishwashing soap (or not at all) and rinse well. With much of the natural food supply depleted from frost-damage the birds are very happy to visit our gardens for food and water. While I'm at it I'm going to clean up the garden furniture, too. 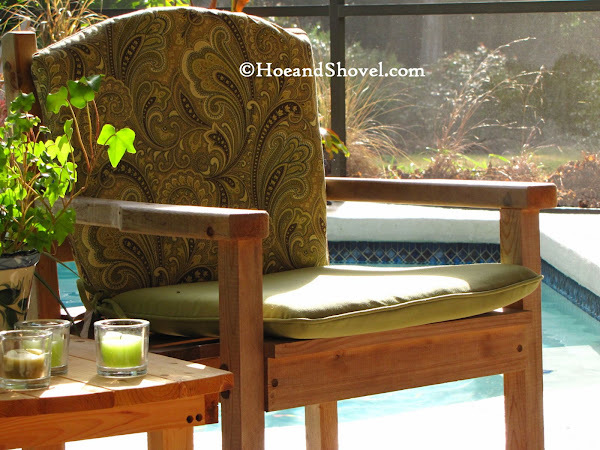 I'll use a spray of Simple Green and good elbow grease to scrub the concrete bench and wooden chairs. 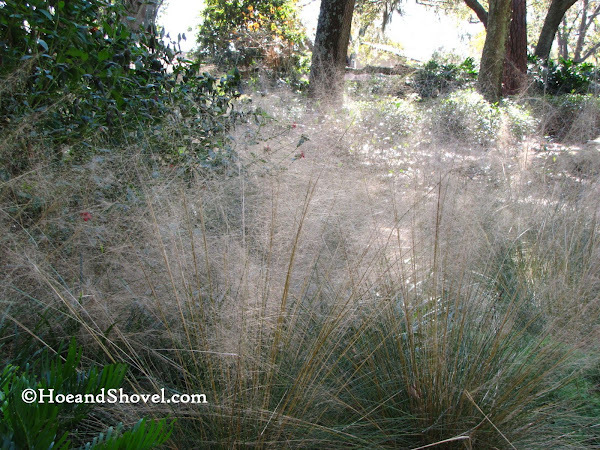 It works beautifully and no toxins involved to filter through the ground. Don't forget to water only when needed. Often our lawns can survive on once a week or less. 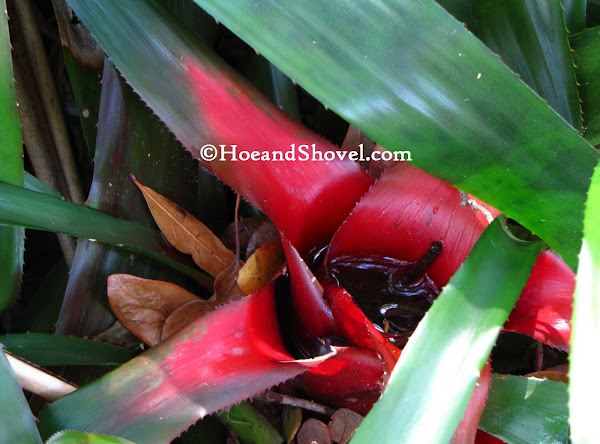 Overwatering in winter does more damage than good ~~ encouraging pests and diseases. Keep adding leaves and kitchen scraps to your compost pile/bin. Or if you don't have one yet this is a good time to start one. Just think of all the damaged shrubs and perennials you'll get to add to it once we start pruning. It's a great way to recycle our winter debris. Order seeds this month if you haven't already. The beautifully enticing seed catalogs are arriving daily. Many of our warm season vegetables will be planted next month. Just as importantly as getting the chores accomplished is taking time to relax and refresh in this fabulous Florida winter! 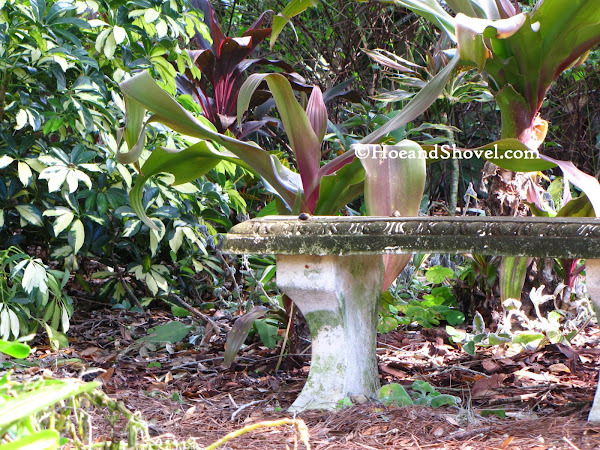 When so many of our northern friends are hibernating indoors away from too much snow we have the blessing of be outside reading, chatting with family and friends, and actually enjoying Florida's exhilerating gardening weather. Can you think of more to add to this short list of possibilities? In a year-round gardening environment there's always something we can be doing to enjoy our gardens. Here's to making the most of EVERY season no matter what it brings in 2011! All photos taken in my garden. For more information on each photo ~~ if clicked ~~ will redirect to my web album for better descriptions in the caption. It is necessary to back-click to return the blog. Thanks for doing this!! Always wanted to have a compost bin ...but it intimidates me. Maybe next blog??? Thanks for the plant list. I have most of those seeds already. Time to refill the containers around here. I'm trying to figure out a way to disguise a compost pile. Always good advice, Meems. Enjoy the sunshine! Great constructive ideas for this time of year in the garden. It is so hard to NOT trim back the dead branches but I am going to be strong and wait. I would like to get some good compost added to the beds before leaf fall. The leaves are my compost. These last few days have been so perfect for being outside. I sure hope we get lots more like them before the heat of summer arrives. OMG! too late! i wandered out on my patio today, and automatically (without a preconceived plan) picked up my clippers and started trimming away. i cannot stand ugly! there was already some teeny green growth showing on the underside of the fried upper leaves. they now look bare but bearable, and i will still haul them inside if we have more freezes! Good list here. My neighbor cut all of her plants back after the first frost, hibiscus, ruellia, gaura...you name it. I don't know who's shaking their head the most, me, because she cut her plants or her, because I won't until much later.....neighbor watching is fun! Thank you. Very well-said. As gardeners we want to make the most of each season. Oh, the sunshine has been most refreshing. A post-Christmas present of sorts. My compost piles are disguised by large shrubs to hide the debris. If you can't conceal a 'pile' another option is to bury your kitchen scraps right into the ground of your garden. SO HARD. I know the feeling. That is why I'm training my eyes to see the green and refusing to focus on the brown. Hard. Hard. Now that I've made so many beds and pathways I find I'm having to purchase mulch for the first time in years. The leaves have always been plenty. They should start falling soon... I'm thinking soon-ER than normal with our colder air hitting earlier than normal. I always enjoy reading your blog but especially during winter Meems. It is so full of color and form. 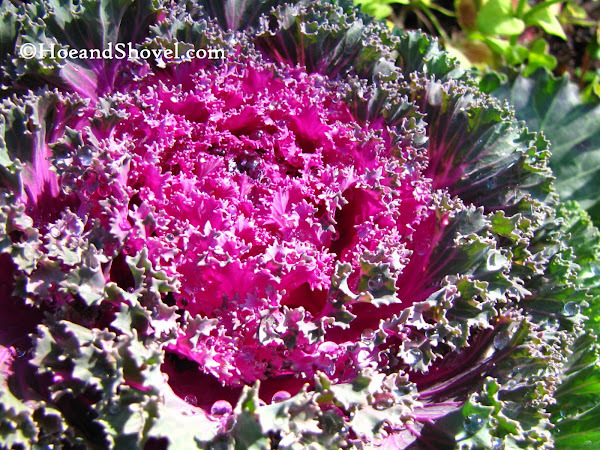 It always reminds me that there are better days for gardening coming my way after we thaw out. It's okay that you cut back your container plants... as long as you never let them stay outside when the temperatures dip. You should start seeing some new growth on them with these warmer temps. Container soil gets warm faster than ground soil (which is what supports the root growth). You are sweet to notice the good. In Florida we are a spoilt group of gardeners not used the weather taking our plants down to the ground. Until the last 3 years when there has been an extreme switcheroo. We're trying to learn to adjust to it but when it is 'unexpected' for some reason it still takes us by surprise. Oh, dear, your crinums look amazing!!! My dozen or so specimens are all melted and turned brown...every last one of them. Creating quite an ugly scene right now. I agree, though, I'm loving the green that still is. Wish I had more. Of course, I always wish that post-freeze. And I am hating the deciduous trees again. True, though, that we notice the pretty trunks more once those leaves fall. It is so difficult for me not to trim back those brown leaves!!!! 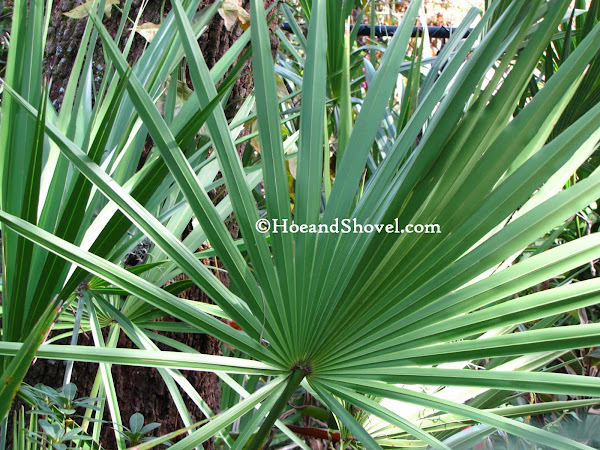 Thanks for all the "other" things to keep us Florida gardeners busy ;) Already have my "wishlist" up and running. Even with all the browns you claimed to have in your garden, it still looks beautiful to me. Yes, there are lots of things on your to-do list are also on mine. We had a great start of the weather this year. Now the holidays are over, and I went back to work, but I had is more urge to do more gardening work than before. 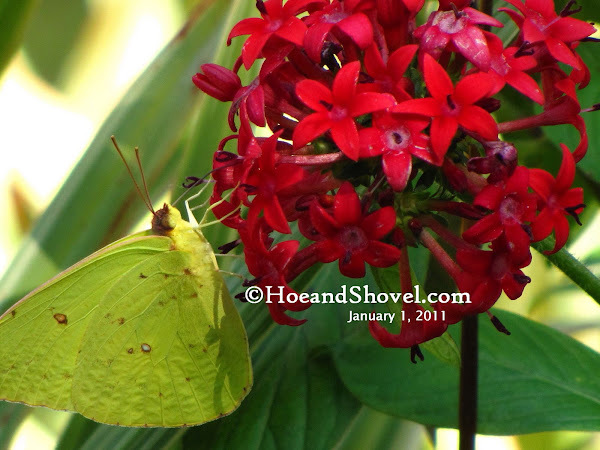 Dear Meems,I also want to use this opportunity to wish you a very happy New Year and a great Gardening year of 2011! There are three crinums back there protected by good tree cover... my prized (biggest) one is not looking good ... not mush but very discolored from frost. Sad. A very knowledgeable person about plants today told me she cut back all her mushy Queen Emmas already. I guess it's a matter of choice. I'm not sure what I'd do in that case. I know exactly what you mean. My head is swirling with wish-lists and plans for improvement. Looking back through photos pre-freeze is kind of a reality check to how pitiful things are really looking now. But I always come back to the fact that it IS WINTER and we will have spring very soon. All will be well again. :-) Thank you for your sweet words and kind wishes. I look forward to more of your pretty garden in 2011.